Are all Roll Form Pallet Racks Created Equal? Despite the popularity of teardrop style pallet racks, many users have found that OPEN BACK roll formed columns cannot always withstand the inevitable fork truck impacts that occur in a busy warehouse or manufacturing environment, causing potential for high maintenance and replacement costs. We put two popular teardrop racks to the test recently at Steel King® our test facility – the SK2000 closed back tubular rack and an open back rack of the same size and same gauge steel. We simulated the impact of a 4000 lb. forklift traveling 3 mph. Watch the video to see how open back and closed back rack survived this type of impact. Steel King Industries has developed an industrial storage rack design that retains the benefits of a boltless rack, while offering substantially more durability – the SK2000® Boltless Pallet Rack series – that provides 250% more frontal impact strength than a comparable open back column. If you’re in the process of planning a new warehouse or distribution center or expanding your current facility, there are many factors to consider when purchasing your material handling rack, from seismic zones to cube utilization, to name a few. 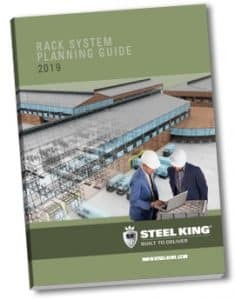 Steel King has developed a guide to walk you through the basics and also some of the often overlooked aspects when developing a storage system, to make sure you get the most for your investment, both today and for the long term. Download your copy of the Rack Guide here. For more information about the SK2000® Boltless Pallet Rack and other industrial rack solutions, contact Steel King today.